EDWARD FICKETT shown with his wife Joyce. Edward Fickett built “palatial” homes for the middle class, world-class resorts, a residence on Switzerland’s Lake Geneva for Charlie Chaplin and renovated an historic L.A. Fire Station, for which he won one of his many awards. 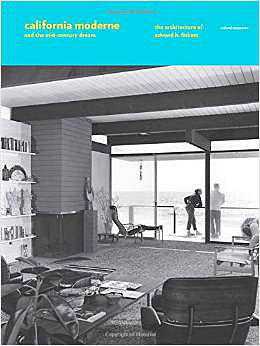 The hardcover written by Richard Rapaport is divided into 11 parts, featuring “Hollywood garden apartments,” “houses in the hills,” “resort hotels,” “beach houses,” “Palm Springs” and more. The book sells for $65 at Chevalier’s and Amazon. He designed the original Sands Hotel in Las Vegas, passenger and cargo terminals at the Port of L.A. and the master plans for Edwards and Norton Air Force Bases. Fickett designed some 60,000 homes, says his widow, Joyce, who grew up on Irving Blvd. 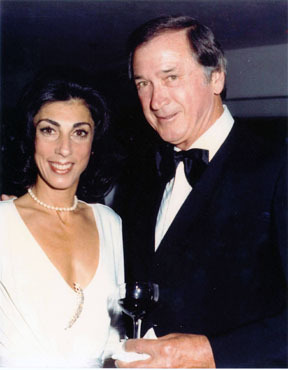 Married in 1980, the couple split their time on Irving and a home at the Fickett-designed Trousdale Estates in Beverly Hills. After his death in 1999, Joyce continued to manage his office on Beverly Blvd. until 2012. RENOVATIONS of this Tudor in Fremont Pl. included an open kitchen and large windows to the outside. He got that chance as architectural adviser to President Eisenhower and a consultant to the federal government on housing. He soon realized there was a lack of manpower to do the job, so he formed a stellar team of Buckminster Fuller, A. Quincy Jones, Rudolph Schindler and Richard Neutra. Calling it the American Institute of Architects University Lecture Series, the esteemed group traveled to Stanford, Berkeley, MIT, University of Florida and other top-notch schools coast to coast to recruit students. When Fickett wanted to add Frank Lloyd Wright to the team, the group bet him $10 the cantankerous architect would never join. CALIFORNIA MODERNE and the Mid-Century Dream. “He got Frank Lloyd Wright and he got $10,” Joyce said. He also got hundreds of students to sign up to help build his vision of affordable housing. 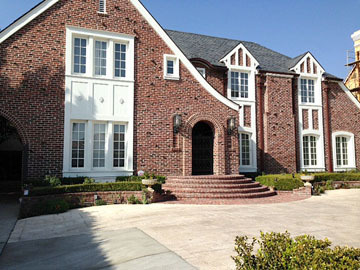 He built some 10,000 homes in the San Fernando Valley with open kitchens and wood, brick and glass throughout. “His theme was always to bring the outside in,” Joyce said. He was a forerunner in raising ceiling heights and floor-to-wall windows. He was the most sought after designer of his day, says Joyce, and had a TV show and celebrity clients who waited up to two years for a custom home. He renovated a 1920s Tudor at 131 Fremont Place. He kept the integrity of the home and added an open kitchen and large windows to add light, said Joyce. When he died in 1999 he was working on the restoration of the city’s historic City Hall. President Bill Clinton presented Joyce with a letter of condolence, along with an American flag. Excerpted from the Daily News, May, 2000. Edward Fickett, a tall, youthful, gregarious man, whom passers-by often mistook for Jimmy Stewart, attended the architecture school at the University of Southern California. Hard times intervened and forced him to leave after his first year and go to work for his father, a building contractor. On one job, for actress Irene Dunne, he walked into the kitchen for a glass of water and found her crying at the table. She said the renowned architects she’d hired from New York and Italy couldn’t translate her vision. Fickett asked what she wanted, and began drawing plans on the back of her blueprints as she spoke. “Yes, my son! Keep going! This is what I want. They haven’t understood,’’ Dunne allegedly told Fickett, then still a teen-ager. Three days later, an anonymous donor paid Fickett’s way back to USC, completely covering his tuition, books, room and board. Years later, Dunne confirmed it was her.